The digital economy provides a number of services for which the marginal price (given an internet connection) is zero: games like Candy Crush, email, web searches, access to information and entertainment, and many more. Because users are not paying an additional price for using these services, this form of economic output doesn't seem to be captured by conventional economic statistics. Leonard Nakamura, Jon Samuels , and Rachel Soloveichik offer some ways of thinking about the question in in "Measuring the `Free' Digital Economy within theGDP and Productivity Accounts, written for the Economic Statistics Centre of Excellence, an independent UK research center funded by Britain's Office of National Statistics (December 2017, ESCoE Discussion Paper 2017-3). ”Free” digital content is pervasive. Yet, unlike the majority of output produced by the private business sector, many facets of the digital economy (e.g., Google, Facebook, Candy Crush) are provided without a market transaction between the final user of the content and the producer of the content. ... Furthermore, because these technologies are so pervasive and have induced large changes in consumer behavior and business practice, these open questions have evolved into arguments that the exclusion of these technologies from the national accounts leads to a significant downward bias in official estimates of growth and productivity. The first contribution of this paper is to provide an argument that, yes, it is possible to measure many aspects of the ”free” digital economy via the lens of a production account. ... To be clear at the outset, this approach does not provide a willingness to pay or welfare valuation of the “free” content. But this approach does provide an estimate of the value of the content that is consistent with national accounting estimates of production. We focus on two types of ”free” content: advertising‐supported media and marketing‐supported information. Advertising‐supported media includes digital content like Google search, but also more traditional content like print media and broadcast television. Marketing‐supported information includes digital content like so‐called freemium games for smartphones or recipes from BettyCrocker.com, but also more traditional content like print newsletters and audiovisual marketing. Conceptually, the barter transaction between the producer and user of “free” information is nearly identical to that with advertising‐supported media. The main difference is that advertising viewership is almost exclusively ”purchased” by media companies from the general public and then resold to outside companies. In contrast, the marketing viewership that is exchanged for “free” information is generally ”purchased” by nonmedia companies from potential customers and used in‐house. A number of interesting insights emerge from this approach. Here's a figure showing total US advertising spending over time as a share of GDP. 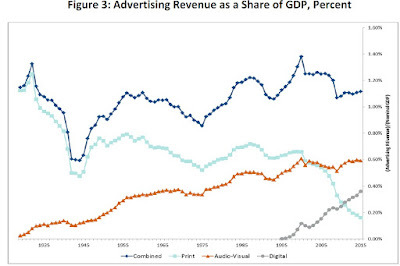 Total advertising revenue has been fairly stable over time, with the abrupt fall in print advertising being mostly offset by a rise in digital advertising. 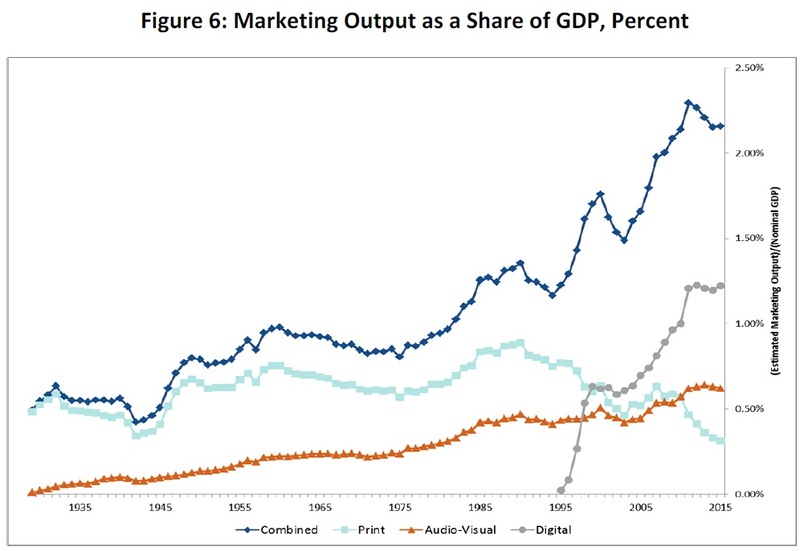 This figure shows total expenditures on marketing over time as a share of GDP. 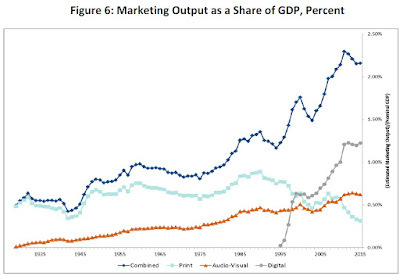 In this case, spending on print marketing has declined, but because of rising expenditures on digital marketing, total spending on marketing has risen by more than 1% of GDP in the last 20 years. categories together annually raise nominal GDP growth by 0.033 percentage point, raise real GDP growth by 0.080 percentage point, and raise TFP growth by 0.073 percentage point. ... These revised numbers slightly ameliorate the recent slowdown in economic growth—but not nearly enough to reverse the slowdown." This analysis seems broadly sensible and correct to me: for a previous argument along similar lines, see "How Well Does GDP Measure the Digital Economy?" (July 19, 2016). But it comes with a warning that applies to all discussions of economic output, and is recognized repeatedly by the authors here. GDP is measured by the monetary value of what is bought and sold, but it doesn't measure consumer welfare (or "happiness" or "utility") in a direct way. Thus, it's possible that even if the gains to GDP from including "free" digital services are relatively small, perhaps those small gains are increasing consumer welfare and happiness by a much larger amount. Of course, one can make a similar argument that the monetary value of certain other outputs, from broadcast television back in the 1960s and 1970s, or the availability of aspirin, is a lot less than the consumer welfare generated by these products. Measuring "the economy" is an exercise of adding up sales receipts, while thinking about benefits and costs of economic patterns (as has long been recognized) is a much broader exercise.